Van Halen returns next Tuesday with “Tattoo,” the first single from their forthcoming album. The VHND reports that one week from today, Van Halen will release “Tattoo” as the project’s lead track. The band’s first album with David Lee Roth in 28 years arrives February 7 – still no word on the record’s title. 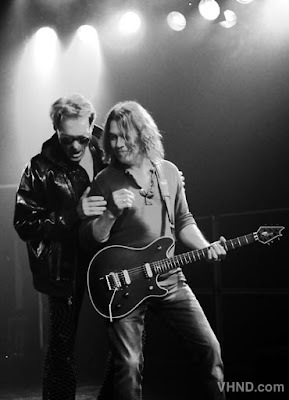 The site also says the 2012 Van Halen tour starts in February, with opening night happening in Louisville, Kentucky. The full list of tour dates for the first leg of shows should be revealed soon - anytime between now and when the tickets go on sale January 10. Some media are getting an advance preview of VH 2012 as the band plays a private show this Thursday at the 250-seat Café Wha? in New York City. Read more about the club show here.